If you're looking for where to stay in Penang, for the best hotel in Penang for business travel, or just a clean and affordable modern hotel in Georgetown, Malaysia for your travels, I've got a great option for you - and many of the rooms in this top Penang hotel even come with their own massage chairs to boot! 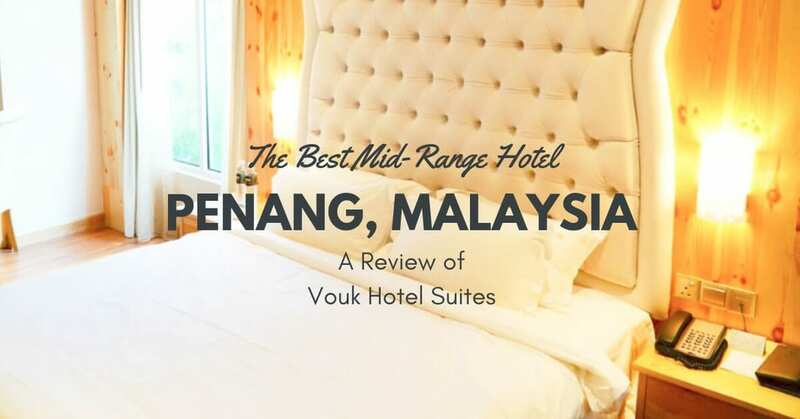 In this detailed review of the Vouk Hotel Suites, I'll cover why I choose it as the best hotel in Penang to get some work done while in Georgetown while also exploring some of the best things to do in Penang. Disclosures: if you book a hotel in Penang through the affiliate links in this post, I may receive a commission. My first few nights were covered by Vouk, though I loved the hotel so much that I extended my stay at the full rate. 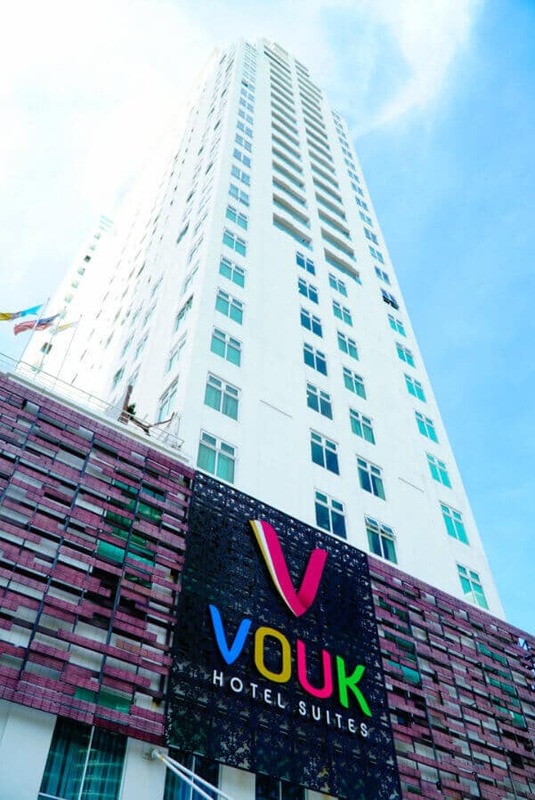 Vouk is a modern skyscraper-style hotel on the edge of downtown Georgetown, Penang. It shares a building with Vouk Suites @ Mansion One, a Condotel style property billed as a great place to stay for families or longer term stays in Penang. Click play on the above video to get a quick tour of the hotel! Location: Vouk has a really great location just a few minutes from central Georgetown, but on the side of the city that makes it easier to get to the beach! Cleanliness: The modern rooms at this relatively new hotel (only about 3 years hotel) are beautiful and perfectly clean. WiFi Speed: The internet connection was super fast (I tested it at 65.8 Mbps down / 34.0 Mbps up). I spent much of my time in Vouk working on follow up to my annual Best Places to Travel in 2019 series, plus did a lot of video editing for another project, and I never had any WiFi issues at all. 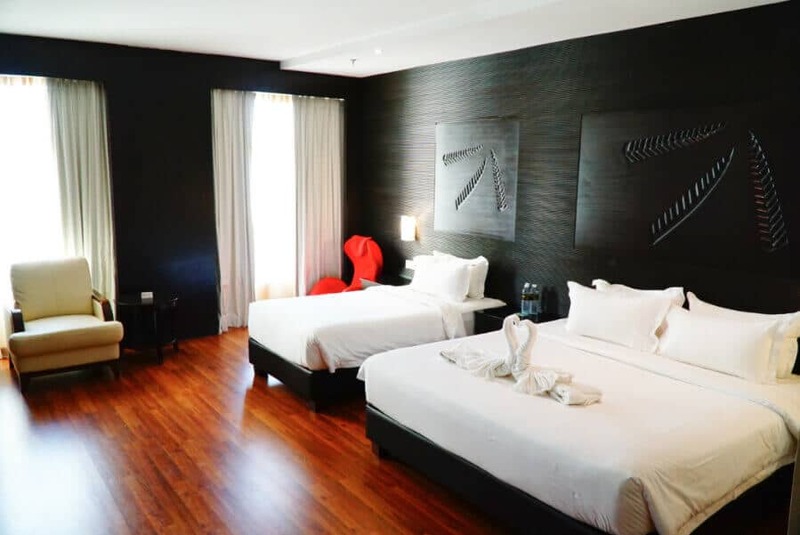 Affordability: Malaysia definitely isn't the cheapest country for travel in Southeast Asia, but Vouk is a great budget-friendly mid-range Penang hotel option. When I stayed in early 2019, double rooms were running about $50/night on Booking.com. Considering how modern and stylish this hotel is, that's a steal! Add in excellent breakfast options and a massage chair in many of the room (yes, really! ), and you can see why Vouk may well be the best hotel in Penang for digital nomads and business travelers. The rooms were spacious, comfortable, stylish, and remarkably clean. All the rooms have a huge TV screen! Pro tip: bring along your own Amazon Fire Stick for a late-night Netflix bing (it's one of my favorite travel gift ideas). Vouk's rooms also offer multiple seating options and large showers, so there's plenty of space. Every floor of the Vouk Hotel Suites has a slightly different style: I really liked the birch wood feel of my 4th floor suite, but I might suggest a higher floor so you can get a view (some of the corner suites offer views of Georgetown and the ocean from your in-room tub!). In-room Massage chairs (selected rooms)! Where choosing where to stay in the island of Penang, most travelers will pick either Georgetown - the colonial city that's the heart of Penang island - or the Batu Ferringhi beach area further north. I recommend staying in Georgetown and taking day trips to the beaches, since Georgetown is where it happens in the evenings. What I love about Vouk's location is that it's just on the edge of Georgetown, so you don't experience any of the noise of the city center, and it's on the side of the city towards the beaches, which are about a 25 minute Grab or taxi ride away. Note that it's not quite as walk-able as other locations in central Georgetown, but a Grab (the Malaysian version of Uber) to town only costs $1-2 USD and takes 5 minutes, so it didn't bother me at all. The hotel is also about 30 minutes from Penang Airport. 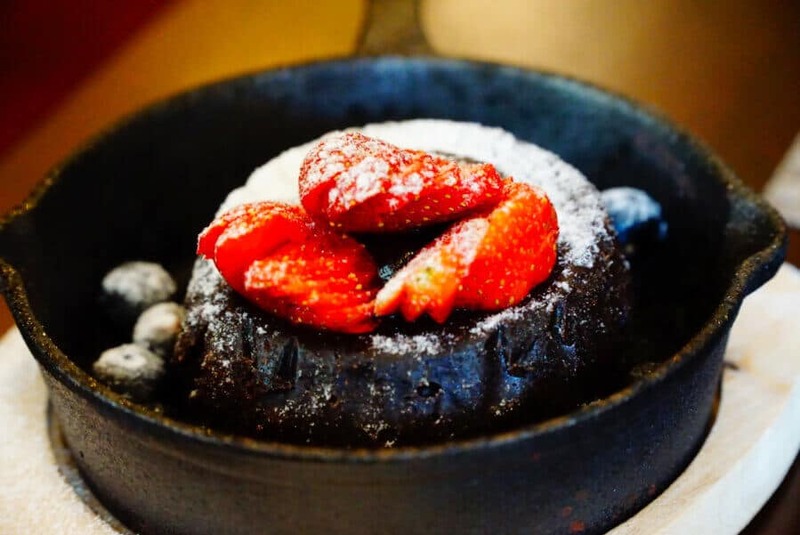 I'm not much of a foodie, but I was blown away by how incredible the food was at the Vouk Hotel Suites, Penang. To start with, you get TWO choices for breakfast! 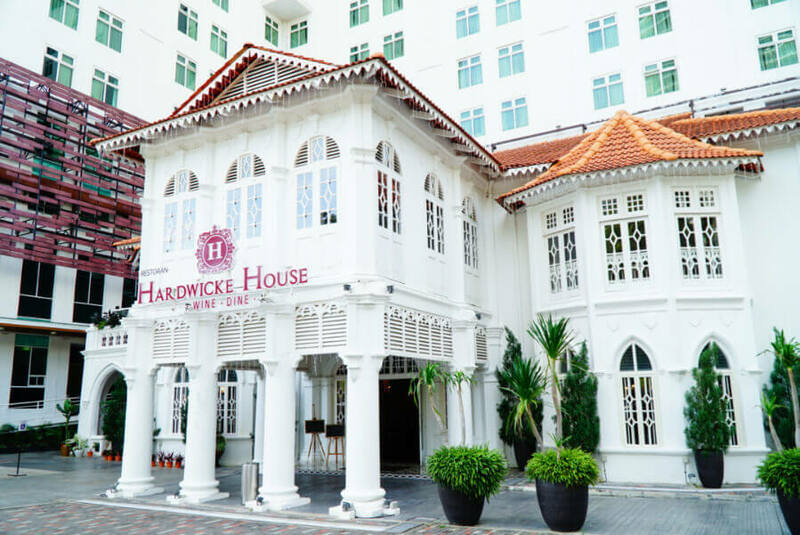 You can dine at the enormous buffet on the second floor restaurant, C'est Si Bon, or at a set menu at the attached Hardwicke House, a fascinating colonial mansion next to the hotel that Vouk preserved when they built the hotel. I also ate lunch there one day, and the food was excellent (just look at the above lava cake!). Oh, and when I needed a Netflix kind of night, I was really surprised by how delicious and affordable the in-room dining was! 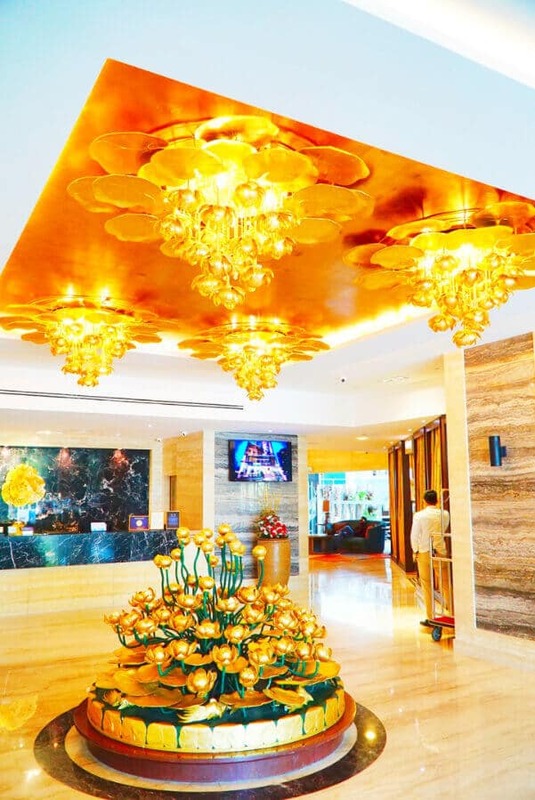 The Vouk is a four-star hotel that has some great facilities for business travelers to Penang: namely, an awesome conference room on it's second floor that makes it one of the best hotels in Penang to host a conference. It also has a huge stylish lobby, a cafe/bar, and multiple restaurants. Plus it offers free shuttles to Gurney Plaza. But note that it is missing a gym or public rooftop (the higher floor corner rooms do have balconies though). It also doesn't have a pool yet but I was told they are building one! All in all, considering this is a budget-friendly hotel in Penang, I wasn't bothered by any of that! Staff can really make or break a hotel, and Vouk may very well have one of the best hotel staffs in Penang. From the housekeepers, to the bar staff, to the reception, every single staff member I encountered was incredibly responsive and friendly. I had time to chat on a personal level with many of them and, like much of the service staff in Malaysia, they come from all over the world. Overall, it's hard not to see why the Vouk Hotel Suites is one of the best hotels in Penang. Considering its affordably price, it really delivers on all the amenities you really need for a business trip, to work as a digital nomad, or for a vacation to Penang with your family. The rooms are super clean and stylish, the beds comfortable, and the WiFi is fast. 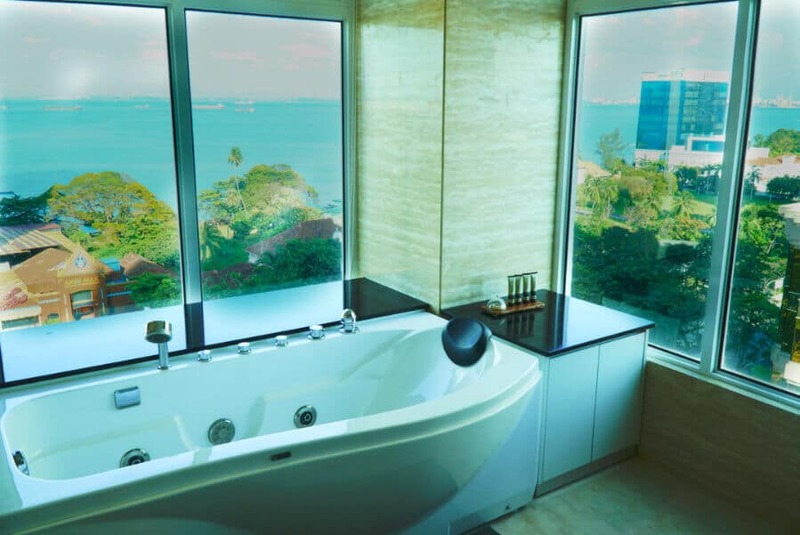 Plus, it comes with lots of bonuses like in-room massage chairs, two great breakfast options, free shuttles to Gurney Plaza, and tubs with a view in select rooms. Looking to book a stay at the Vouk now? Head over to Vouk's website or click here to check pricing on Booking.com! Oh, and if you're a digital nomad or looking for the best apartment in Penang for longer stays, check out their sister property: Vouk Suites @ Mansion One by clicking here. 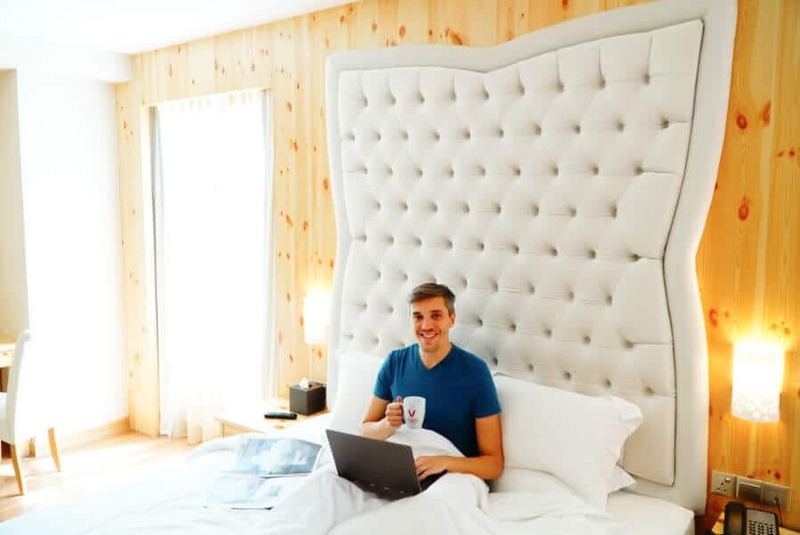 That's it for this review of the best hotel for digital nomads and business travelers in Penang, Malaysia. If you're headed to Penang, be sure to check out my complete guide on where to stay in Penang. You also won't want to miss these 33 Awesome Things to Do in Penang. I think #6 is my favorite. And before you go, check out how to get a free Lonely Planet Malaysia digital download for your trip!